Students: Do you have a voice within your university? What is the most rewarding learning experience you have had on your programme/course and why? What makes your experience as a student a valuable one? Do you have a voice within your university? Are you listened to? If so, how is your opinion heard/acted upon? Where is your voice heard? By whom? What can you contribute to enhancing the learning experience? Who are the quality managers in your institution? Each partner submitted a summary of the main outcomes of their student focus group to the European Students Union which has produced a draft summary report of the key findings from each of the focus groups. In all focus groups, communication is identified as an important element of a good institution. However, according to the participants in the discussions, communication is the most common problem. Students require better communication teacher-to-teacher, teacher-to-student, student-to-student, student-to-teacher, student-to-administration through regular meetings, round table discussions etc. In addition to communication, students are looking for an opportunity to apply their learning. In terms of their understanding of the quality processes within their institutions it was found that in general students do not know who the quality managers in their institutions are and there is considerable variation in the effectiveness of class representatives and students. 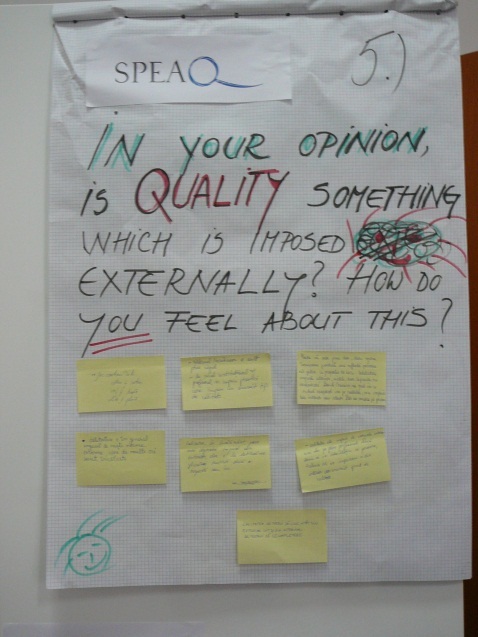 Finally, when asked about quality enhancement students appear to have ideas about how the learning process could be enhanced, but are not so creative when it comes to their personal involvement. Welcome to the SPEAQ project! and partners: Anca Greere (Babes-Bolyai University), Ole Helmersen (Copenhagen Business School), Mariluz Suárez Castiñeira (Deusto University), Christine Lechner (Innsbruck University), Fiona Crozier (QAA England), Klára Szabó (Szeged University), Natalia Tarachiu and Allan Päll (the European Students’ Union),Gillian Moreira (University of Aveiro), Anne Räsänen (University of Jyväskylä) and Kate Riley (University of Trento). connect three key quality circles: teacher, student and quality manager in order to share and enhance quality assurance practice in higher education. This project sets out to address a real concern that quality assurance can become ritualised rather than embedded in learning and teaching practice. The outcomes from this project will seed new ideas on how to approach quality assurance within the institution providing evidence of how bringing together stakeholders in the quality process can lead to a wider and more meaningful interpretation of quality assurance. It will collect data on different stakeholder perspectives on quality assurance and undertake small projects at institutional level which will explore ways in which a more shared vision of quality assurance can be fostered at institutional and disciplinary level. SPEAQ will be building on the work of the LanQua (Language Network for Quality Assurance) which explored issues of quality in the context of the discipline of languages. It developed a toolkit (The LanQua Toolkit) to support frontline (academic/academic support) staff in conceptualising and describing quality from their practice perspective. So over the next 19 months, we are going to set up interactive workshops to facilitate discussion between teachers, quality managers and students, collect data on stakeholder views of quality assurance and enhancement, disseminate the project outcomes and more. To find out more, keep reading our posts!